Dodge trucks were provided with two different style steering setups from 1972 to 1993. The non-typical 1972-1974 style has distinct advantages for those looking to do such modifications as larger tires and lifts up to 3", especially on diesel trucks that have a lot more weight on the front end. On a typical setup such as the one above (1975-1993), the steering box is oriented with the sector shaft (the shaft that rotates the pitman arm) pointing down at the ground. 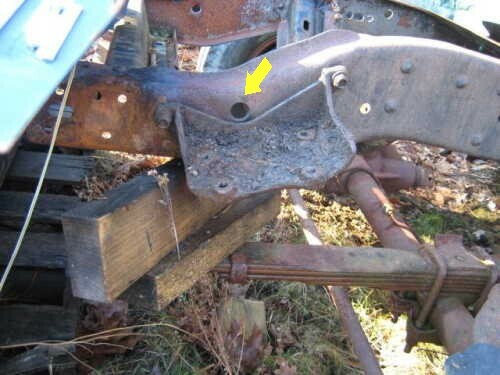 On a stock truck, this will not cause an issue because forces are not sufficient to wrack the frame or the three bolt mounting plate. The universal joint is also located on the steering box input where it is exposed to road salt, water and grime. Note also in the picture above, the drag link is approximately parallel to the ground, directing forces front to back in the direction that the frame and mounting bracket have greatest strength. When you add the extra weight of a diesel engine and larger tires, the forces are greatly increased and you may find that the stamped steel mounting plate is pulled and pushed from the frame very slightly, which can be seen when you inspect it while a helper is turning the steering wheel. The problem is multiplied when a lift is added because the drag link, instead of being parallel to the ground as intended by the engineers, is angled up from the steering arm. This angle may noticeably lift your bumper up in relation to your grill as you turn the wheels. The forces created here can not only crack the mounting plate for the steering box over time, they can actually flex the left front spring bracket to the point of failure. Both of these factors can create excessive steering play, and also lead to failure of steering and suspension systems. There are many kits offered which can lower the angle of the drag link to prevent some of these forces, but I don't believe they solve the problem entirely. The non-typical 1972 to 1974 steering setup pictured below has several advantages. The box is mounted on a cast iron plate, which is much stronger than the stamped steel bracket, and the sector shaft is pointing to the left. This allows the pitman arm to point straight down, dropping the drag link a few inches. This setup applies torsion in the direction the frame is strongest. With a diesel engine, 315/75 tires and a three inch lift, the amount the bumper wracks is almost negligible. There are additional advantages. The earlier steering shaft provided with this setup was better due to larger internal components of the u-joint and it was mounted at the upper end of the steering column out of the water and grime of the road. You will find there are a great many in junkyards that still have zero play, just like the one pictured on the right side of the picture below. The only issue is that rebuild kits are not available, as far as I have seen. When getting this setup from a junkyard, you will need to get the steering shaft, steering box mounting bracket, steering box, pitman arm, drag link, power steering hoses (and the high pressure fitting from the back of the power steering pump if you are converting a diesel setup). -When converting a diesel application to this setup you can easily take the high pressure fitting out of a gas power steering pump and put it in the diesel power steering pump so the older style hose will fit. -Removal and installation of the steering box is much simpler, only requiring four mounting bolts to be removed instead of seven, unless you have the newer style inner fenders. I usually remove the portion of the left inner fender that interferes. -Manual steering shaft rag coupler splines will not fit the power steering box. -Non-typical drag link IS different than typical drag link, don't confuse the two. -The allen head adjuster screw for the sector shaft end play adjustment may rub on the frame when you convert the steering box to the new geometry, necessitating slight egging of the hole (shown in picture #3) provided in the frame to gain clearance. -Non-typical steering box is 13/16 input 32 spline plus or minus a few depending on the flat spot. This steering box is reversed rotation, do not use a standard rotation steering box. -Remanufactured steering boxes are readily available: Advance Auto Parts part #997 or NAPA #88-278051. The rag couplers with splined metal portion for the input shaft are cheap (shown on the input shaft in picture #3 and #5) and manufactured new, part #201 through Advance Auto Parts. -NAPA lists two different draglinks depending on the year of the truck: NCP2721132, a straight draglink that fits the '72 to '74 Dodge W300 NCP2721411, a bent draglink that fits the '75 to '77 Dodge W300 I cannot say which you should use, so it is up to you, but one of the draglinks is an inch longer center to center. -You may find a setup from a 1978 or 1979 Ramcharger that looks like what you want. It is OK to use; simply note the input shaft for the steering box is ¾ 32 spline and rag coupler assemblies are no longer offered when researched by application. I suspect the eighties Camaro coupler might fit, but I don't want to take the fifty dollar gamble. If you have a fleet that you want consistent, I recommend converting it using the part numbers previously mentioned. The Ramcharger steering boxes were only made for two years and thus are expensive and hard to come by. I somehow got stuck with two and spent two hours researching what on earth they were from. 1. Is there a rebuild kit available for the older style steering u-joint? Answer by Sam Bledsoe: The early steering shaft joints are very tough to find and have been long since discontinued from Chrysler and the aftermarket. 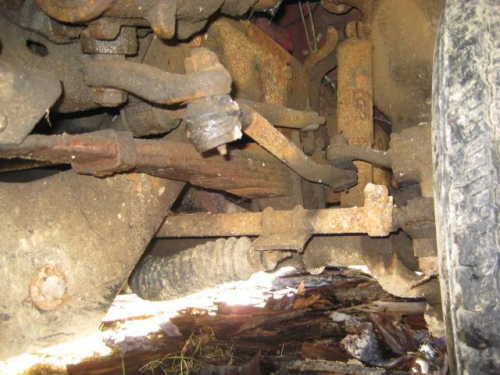 The 1979-93 steering shaft coupler joints are problematic, and can be worn out in as early as 30k miles. The best fix is a Borgeson unit for around $250. The factory parts can be bought for less than $200, but you can be fixing it again within 30k miles. You can get a steering shaft rebuild kit for around $12, which is good, but the coupler does get wear and it is a spendy part. 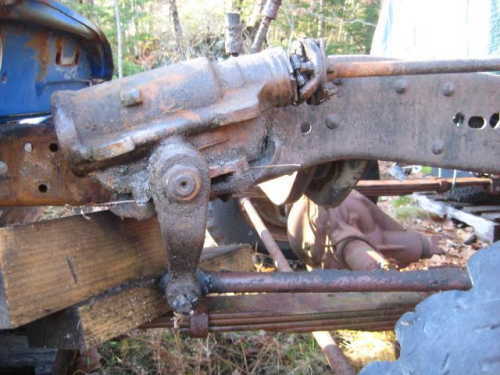 The 1978 only style steering shaft joint used the early style joint, similar to the 72-77 style, only in a different configuration, also know as the "Bell". Additional information by Joe Leonard: The Borgeson replacement steering shaft is sold as 78-93 but will actually work on at least 75-93. 2. For what reason are there two styles of the non-typical drag links? Answer by Sam Bledsoe: The straight and bent drag links are dependant on which style steering box you have. The early steering drag links are bent and the later ones are straight. They are the same for W100 - W300. 3. What years and models were the non-typical styles put in trucks after 1975? Was it all four drive trucks through 1977, or were they all switched to the typical style except the Ramcharger? Answer by Sam Bledsoe: The base steering gear was a manual unit from 1972-1977, and most military M880's were manual steer trucks. 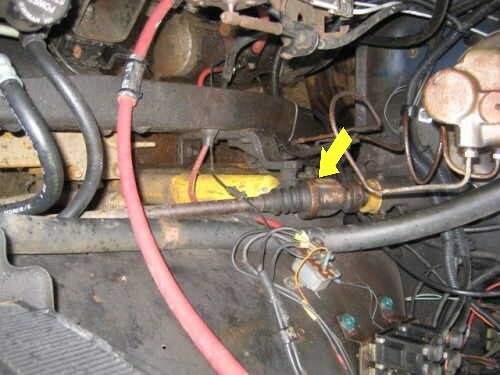 The 1972 4WD thru 1977 4WD had the same style Power Steering box unit. Then came the 1978 thru 1993 units that had the "stamped steel" mounting bracket and a different rotation steering gear. This bracket is prone to cracking (which is one of the reasons for this tech article). Additional information by Joe Leonard: The 72-74 pitman arm was approximately 1/2" longer than the 75-77. 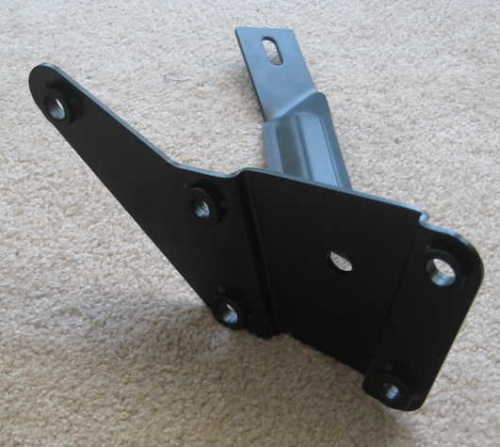 The stamped steel bracket from a gas 78-93 truck can be used in a diesel, you just have to drill the mounting holes in the bracket larger. 4. What drag link can you use if you have a Dana 60 front differential instead of a Dana 44? Answer by Sam Bledsoe and Tyler Warnke: The drag link is the same for both Dana 44 and Dana 60 trucks. 5. There is a steering brace kit for the 4WD trucks. Does anyone have the TSB about the brace? Additional information by Marv Neal. The bracket mounts inside the frame. It was first offered in 1992 on 4WD diesel trucks and really helped with stamped steel bracket cracking and frame cracking. Another thing that helps the stamped steel bracket live is burnishing all the holes to ease all the sharp edges so a crack has a more difficult time getting started. 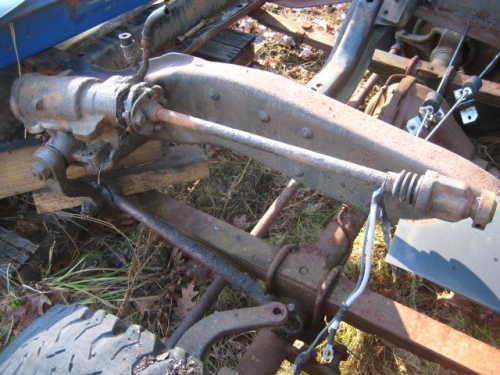 Marv said he sold every one of the frame rail steering gear reinforcing brackets that came into his yard. Marv agrees the earlier setup with better geometry is better when a combination of a raised truck, big tires, and a diesel engine is being used. Steering box tech article written by Tyler Warnke. Copyright 2011. If you have any questions please contact Tyler at: beastmobile@hotmail.com This article is written for informational purposes only, any vehicle modifications made by readers of this article are their responsibility.